Festive, flavorful and fast! 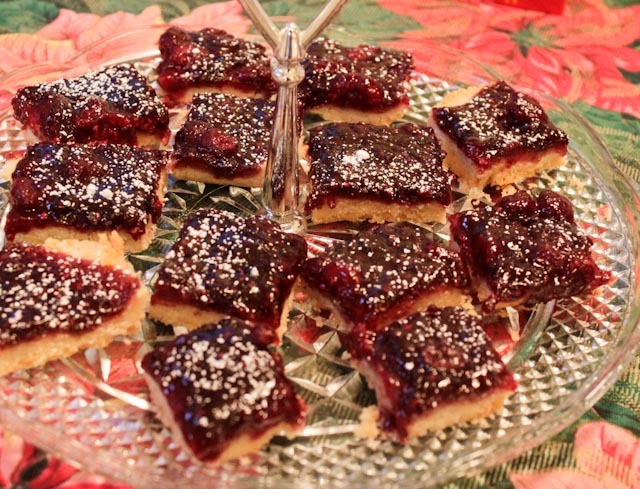 You will love this new twist on traditional Linzer Torte. Place flour and 1/3 cup powdered sugar, butter, lavender and vanilla extract in a food processor. Pulse to combine and break up butter into pea-size pieces. Pour flour mixture into an 8 x 8 – inch ungreased baking dish, smooth into an even layer and tap with the back of a spatula to form a crust. Bake until crust begins to turn golden, about 20 minutes. While crust is baking, combine preserves and frozen raspberries in a small sauce pan. Cook over medium heat until preserves turn to liquid berries are thawed about 3 to 5 minutes. When crust is ready, remove from oven and pour raspberry mixture over top of hot crust and smooth into an even layer. Return the pan to the oven and cook for another 20 to 25 minutes until set. Remove from the oven and cool in pan until just warm. 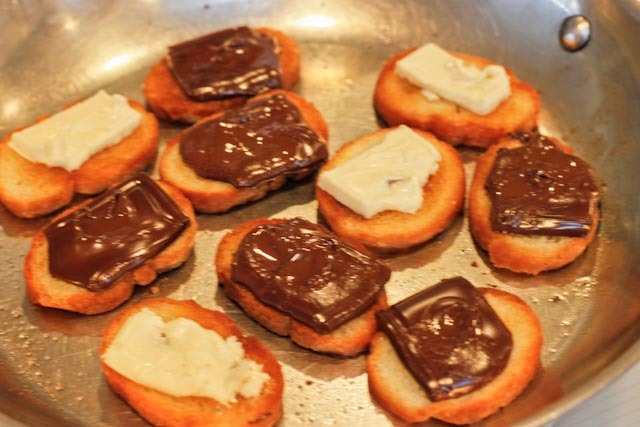 Cut into 25 squares, remove from pan and cool completely. When raspberry bars are completely cool, dust with remaining tablespoon of powdered sugar. Lavender Discovers Lavash: It’s a Match! “Have you ever made lavash?” asked my friend, Mike Neustrom, lavender grower from Kansas. Mike said he’d been wondering how it would taste with lavender seasoning. I could not resist this culinary challenge and pledged to find out. 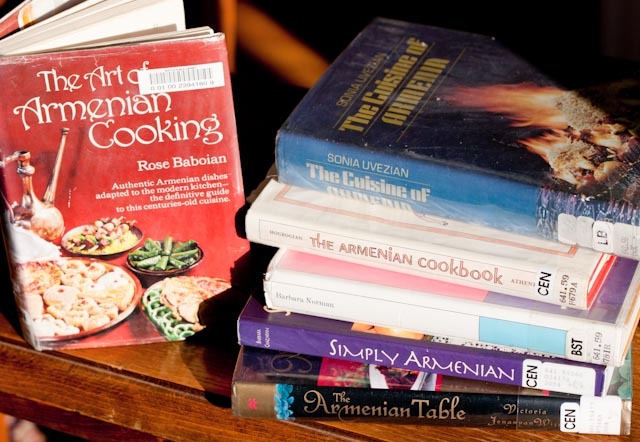 My first surprise came when I looked through my 1970’s “Joy of Cooking.” The index didn’t list “lavash”, however when I searched for “flatbread”, I found a description (“Armenian, Greek, Arab, Syrian, Euphrates Bread”) along with a recipe. More questions entered my mind, such as where and when this bread originated, how it was first made and what role did it serve in the country’s cuisine. Further research revealed the answers to these questions. 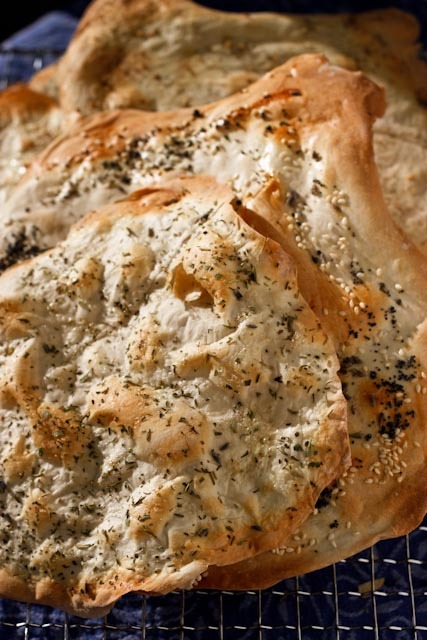 Flatbreads date back nearly 10,000 years. Grain mashed and mixed with water or milk created dough that became the earliest form of bread. The dough was rolled thin and cooked over high heat. The quick cooking time preserved scarce fuel. This method of converting grain into bread provided a durable and portable source of nourishment throughout the winter. Many countries developed their own version of flatbread. Lavash originated in Armenia in the Caucasus. Where did lavash get its name? It’s an Armenian name with two parts. The first part “lav” means “good”. And “ash”, the second part, means “food, meal”. When joined, the meaning is “good food”. In pursuit of a lavash recipe, I turned to the internet. Googling “lavash recipe” returned more than 600,000 hits including a recipe on All Recipes and a link to a “Lavash-Making Challenge”. After browsing for a bit, I settled on the lavash recipe posted in the All Recipes website. I selected this one for two reasons: 1.It met my criteria for an unleavened version (no yeast and on baking powder) and 2. 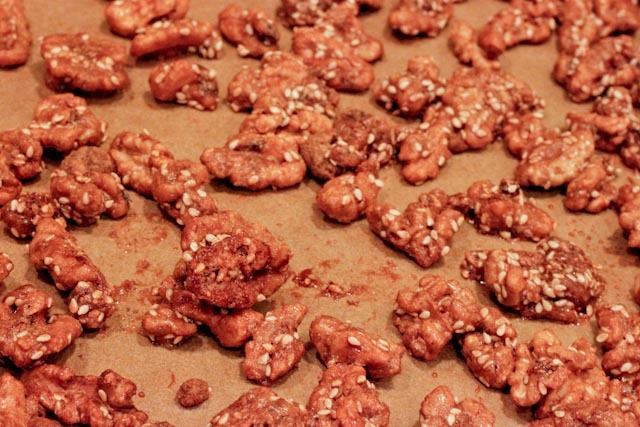 Readers gave it rave reviews and offered tips for baking and serving. Lavash recipe in hand, I was ready to bake. First I took a quick trip to the grocery store to see whether they sold lavash. The day before Thanksgiving, the store was buzzing. Extra employees were helping shoppers. I found one and asked, “Do you sell lavash?” My second surprise that day was when the woman responded, “Yes, follow me.” She led me to the artisan breads and handed me a box of crackers. 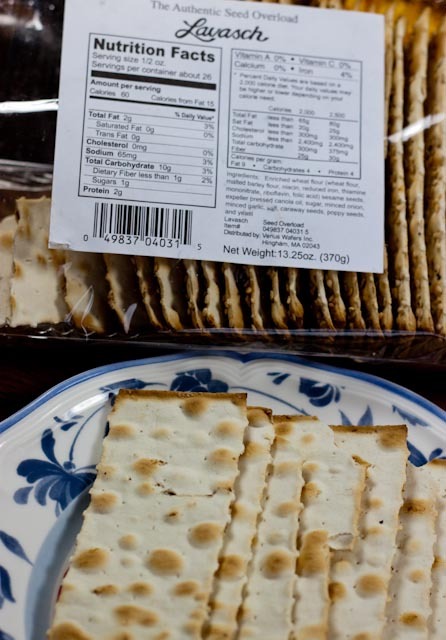 I was shocked at the price of $6.29 – for a box of crackers, really? Yes, I bought them, but only because I wanted to compare “store-bought” to “home-made”. The ingredients in lavash couldn’t be more basic: Flour, water, sugar, salt, egg white and butter. I mixed the ingredients together into a sticky dough, and then turned it out onto a floured surface, where I kneaded it for 5 minutes. The dough was smooth, soft and stretchy. I inhaled the bread-like aroma. I cut the dough into 10 portions, and covered them with a damp paper towel. I picked up one of the balls and patted it into a disc, and then began rolling it. I tossed it around and rolled it until it was as thin as a tissue. I carefully lifted the dough onto the baking sheet, brushed it with egg white and sprinkled seasoning on top. I used Tuscan Seasoning, a recipe from my book, “Discover Cooking with Lavender.” Other seasoning options include: Herbes de Provence, basil, sesame seeds, poppy seeds, sunflower seeds, caraway seeds, cayenne pepper, garlic salt, cumin or sea salt. I slid the baking sheet into the hot oven and felt a connection with ancient times. Soon the aroma wafting from the oven and filling my kitchen awakened my appetite. I peeked into the oven; the lavash was golden with tiny dimples and puffy bubbles looking like a sun-drenched moonscape. I removed the lavash from the oven, letting it cool on a rack. I broke off a piece and put it in my mouth. It tasted warm, rustic and comforting; I tasted the fresh herbal flavor of the lavender and pungent tones of onion and garlic. In my refrigerator, I found sun-dried tomato goat cheese to spread on the lavash. 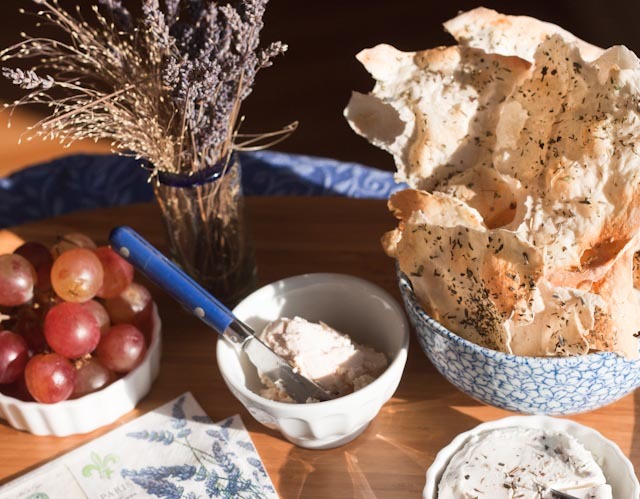 I was savoring every moment of this private tasting experience, when I glance over to the kitchen counter and saw that I still had lots of lavash to bake. 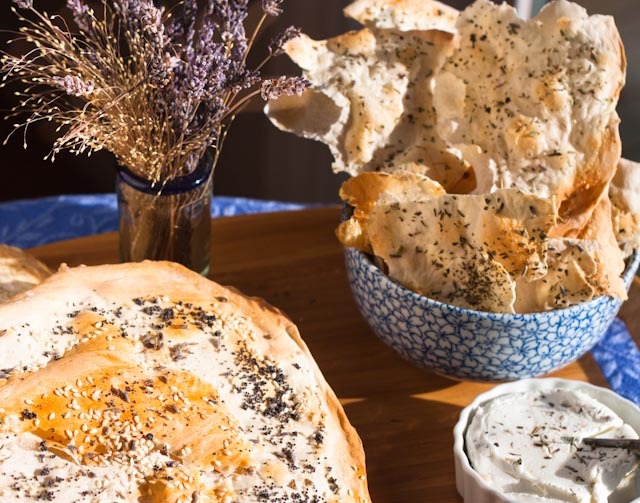 The recipe makes enough for a crowd, and it was not surprising to discover home-baked lavash surpasses the store-bought version in every way – better flavor, less cost, healthier and more seasoning choice. Lavash, not only simple, cheap and filling, gives the creative cook a blank canvas to showcase aromatic herbs, nuts, seeds, spice and artisan salts to create a flavor masterpiece. I’d recommend serving it with humus, olives, feta and other soft cheeses or salsa. Extremely versatile, lavash can be served as a pizza crust, wrap, dessert cookie or cracker or even an eating utensil to scoop up stew, kabobs or as a plate for rice, beans or vegetables. for delicious lavender garlic bread. Place all ingredients in a food processor or blender. Process for 10 seconds or until all ingredients are well blended. Store seasoning in an airtight container. Ak Mak Bakeries makes organic flatbread crackers. Valley Bakery makes large lavash rounds in packages of three. 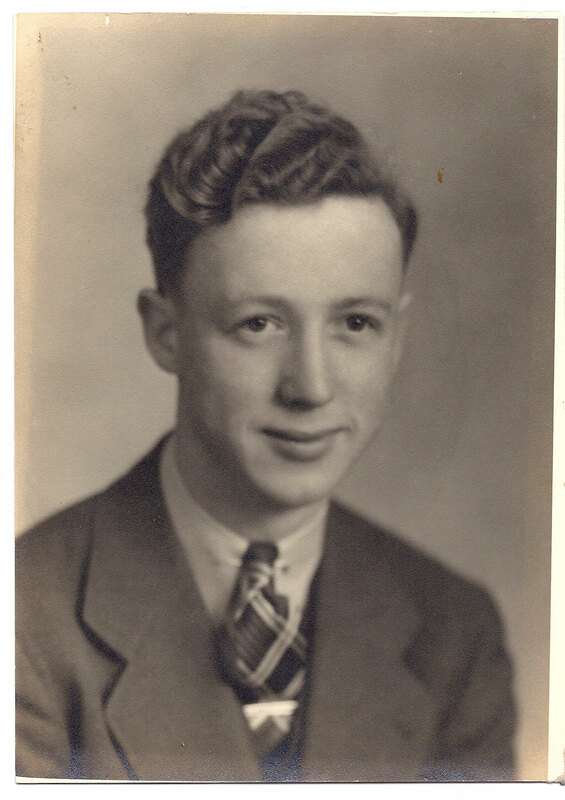 My dad, Cecil D. Clark, was born on this day in 1920. His November birthday was linked permanently with our family’s Thanksgiving celebration. 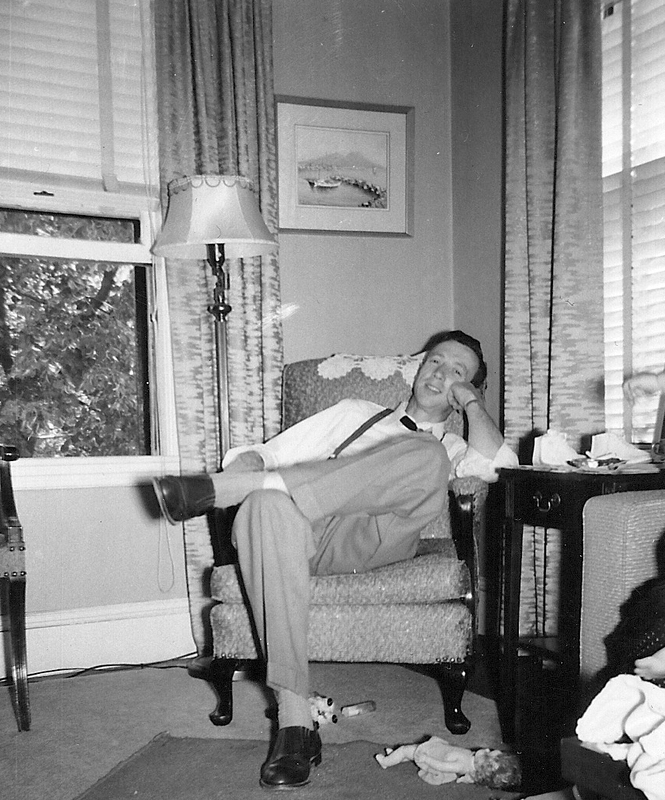 In some years these events coincided date-wise, however whether they did or not, dad’s birthday was always celebrated on Thanksgiving Day. It’s been more than sixteen years since dad’s been gone. And yet, whenever Thanksgiving comes around, he’s in my thoughts. This year when I reflected on the years we spent together, I couldn’t help feeling sad that I did not have more time with him. I knew him for only 50 years, beginning in 1946, the year I was born. Most of that time, I was too focused on myself to have learned much about him. That’s why I’m grateful he wrote “The Life History of Cecil Clark”, even if he only completed the first chapter. In these 43 pages, he recalled his life from his earliest memory of attending Kindergarten in Watertown, South Dakota and concluding with my birth in July 1946. 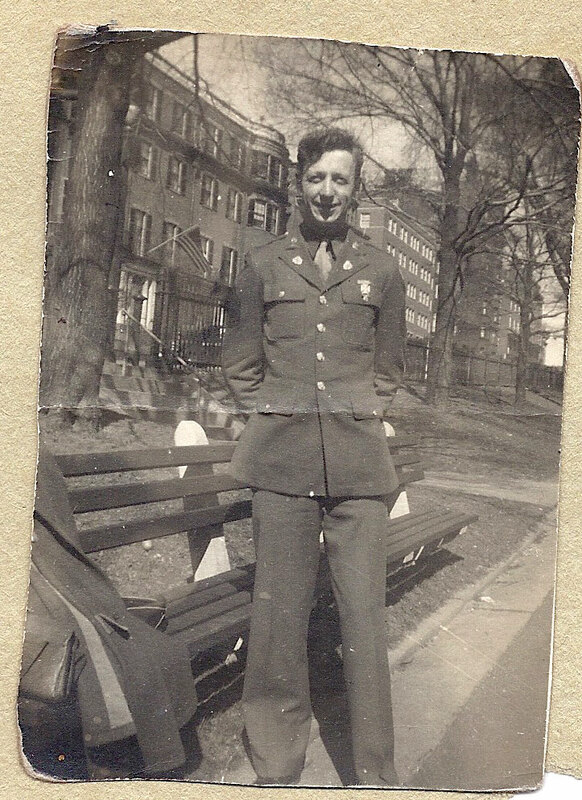 Between those two events, he graduated high school, joined the army, fell in love and married, fought in WW II, returned home to his wife and first baby and began civilian life in Boston, Massachusetts. Without his written account, I don’t know how I would have discovered these details. When we gathered for Thanksgiving last week, my sister Jean, shared photos and other memorabilia about our dad. This material provided additional insight about his boyhood and early adult years. 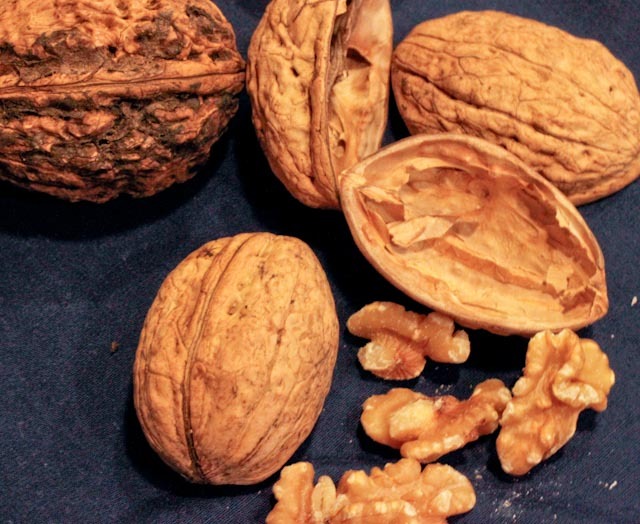 I discovered my father’s persistent passion for cooking, baking and food preparation. I always knew he was comfortable in the kitchen, but what I learned is his passion for food emerged at a young age and continued throughout his life. 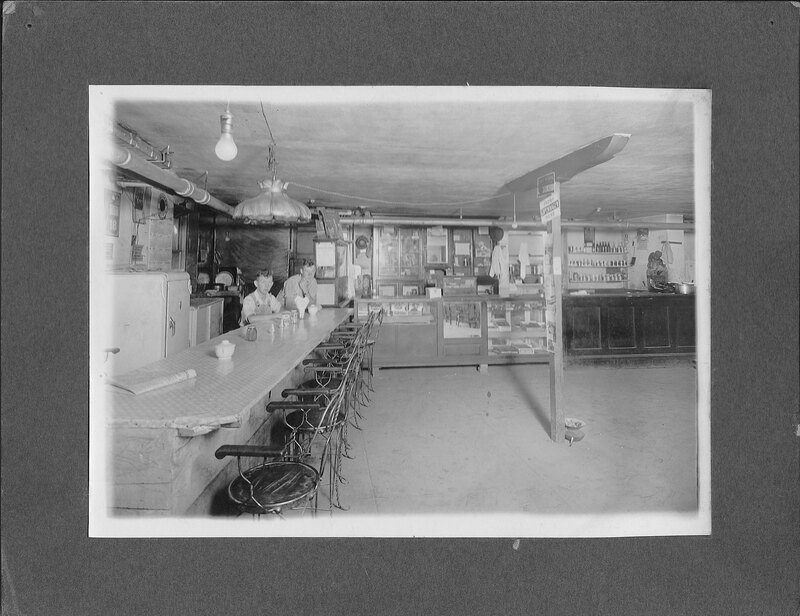 My dad worked evenings in his parent’s restaurant in Richardton, North Dakota in 1936. When I was a girl, dad cooked up his signature dish (and one of my favorites) “Onion Gush Gush” – basically scrambled eggs with chopped onion cooked in lots of butter. 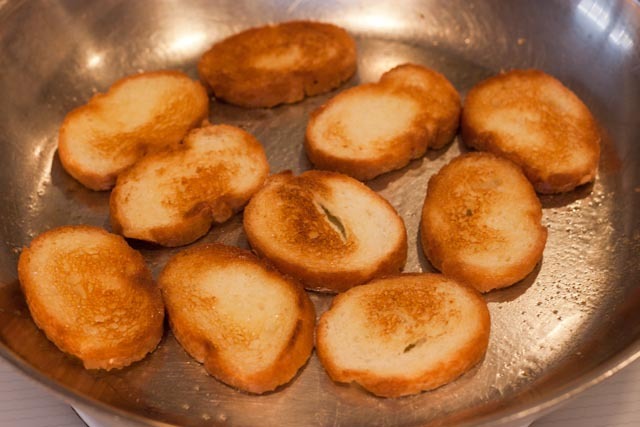 On weekends, mom and dad made English muffins and deep-fried donuts. Fresh fruit and vegetables thrived in our backyard garden. Dad was an adventurous eater. On a three hour layover in Chicago in the late 50’s when we (dad, mom and their five daughters) traveled by train from Tacoma to Boston, Dad hailed a Checker Cab. We went to a downtown restaurant for a quick lunch. Dad ordered turtle soup. Now that I think about it, Thanksgiving is the perfect time to celebrate Cecil. And although, I don’t think he ever cooked with lavender, I know he’d be proud that I’ve carried on his passion for food, flavor and cooking. 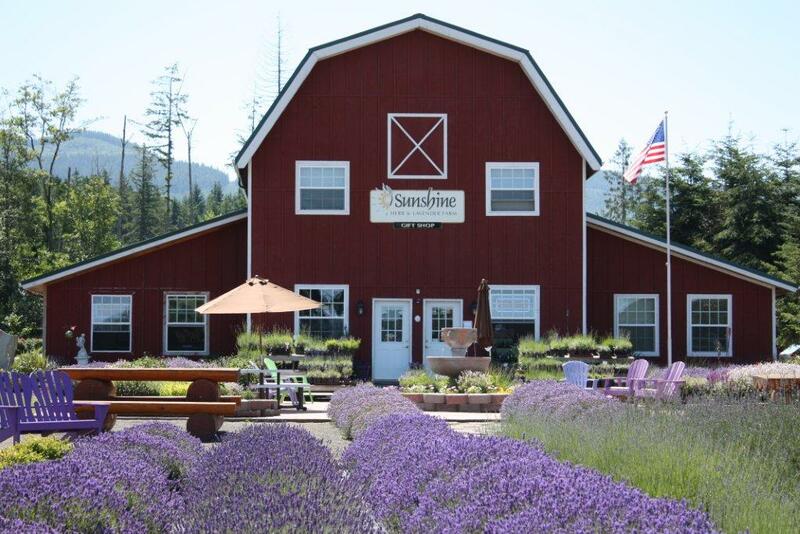 During Sequim’s lavender celebration, I visited Sunshine Herb and Lavender Farm to demonstrate some recipes from my book, “Discover Cooking with Lavender.” Busy talking and signing books, I didn’t have time then to discover the story behind this place. I barely noticed the lavender plants lined up like soldiers in a parade and saluting their fans with purple flowered stems. 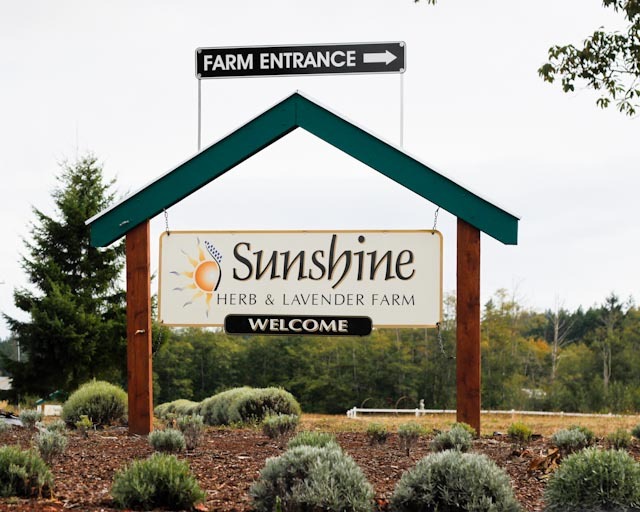 Months later when Scott Nagel called to invite me to speak at the upcoming International Lavender Conference (April 2012), I became curious about how Sunshine Farm became a tourist destination for thousands of people from all across the country and beyond. Agritourism is emerging as a popular way to see working farms, to understand local agriculture and to discover regional cuisines. Sunshine Farm has achieved success in this new industry. I wanted to learn what made this farm so popular. To find out, I returned and spent an early October morning with the farm’s owners, Steve and Carmen Ragsdale. I learned that their formula for success depended on their planning, preparation and passion. Their top ten tips are listed below. 1. Do your homework. Set your goals. Prepare a business plan. Get help if you need it. To help them develop their plans and meet their goals, Steve and Carmen engaged the volunteers at SCORE – a free consulting service that is part of the Small Business Administration. Their goal was to own and operate a lavender farm that would attract tourists. 2. Build on your experience, skills and personal style. Carmen owned and operated beauty salons for 38 years. She had experience creating products using herbs and oils, and she was skilled in customer service. Steve, a naval architect and engineer, understands machinery and planning. 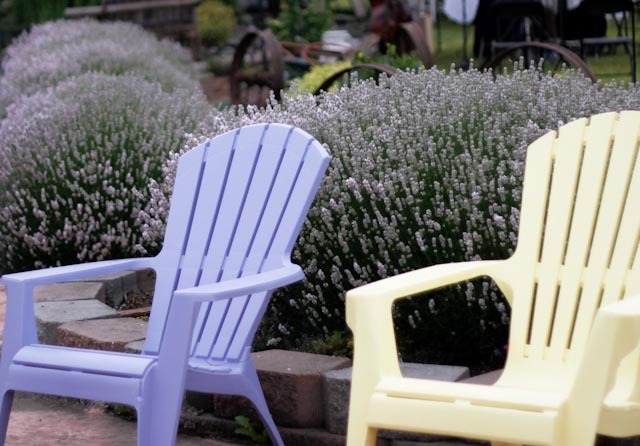 Even before they devoted themselves to Sunshine Lavender, Steve and Carmen grew lavender on the hillside of their Port Orchard property. 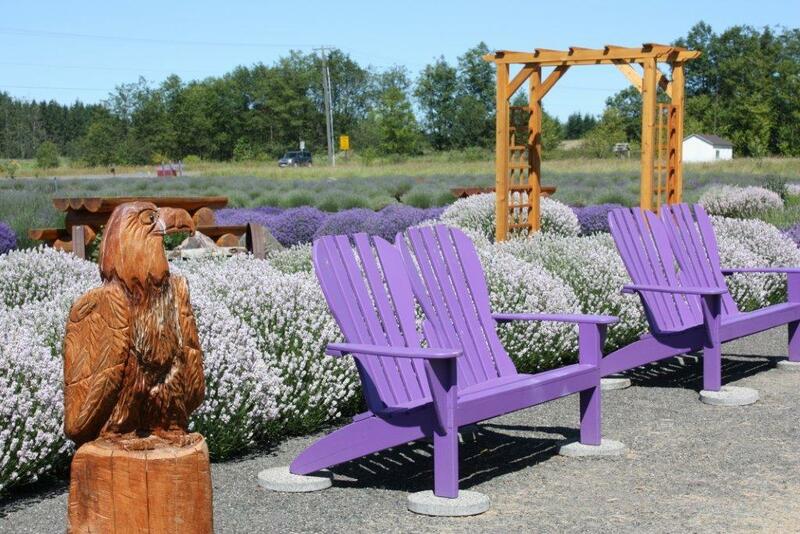 The Ragsdales acquired their property in 2000 and developed their farm in phases: Finding the site, preparing the soil, planting lavender, building greenhouses, propagating plants, creating products for their gift shop, and in 2006 their farm became part of the Sequim Lavender Farm Tour. 4. Select the right site. For lavender, that means soil that is well-drained and slightly alkaline and a site that offers full sun. If you intend to attract visitors, look for a site that is visible and easily accessible. Check out zoning laws and permit requirements. After searching for two years, the Ragsdales found their 10 acre site, just off highway 101, about 10 miles east of Sequim. Their farm is the first one you see when you drive towards Sequim. 5. Make sure your signs are easy to read, and your farm is listed in visitor guides, tourist attractions and in local papers. A large sign makes it easy to find Sunshine Herb and Lavender Farm. Commanding attention, the big red barn and white picket fence can be seen from the highway. In summer, the purple rows of lavender beckon to passersby. 6. Remember your farm is a stage. Keep it looking neat and uncluttered. Make it inviting, with clearly marked paths, places to sit so your guests can relax and take in the beauty. Sunshine Herb and Lavender Farm reminds me of a palace garden. 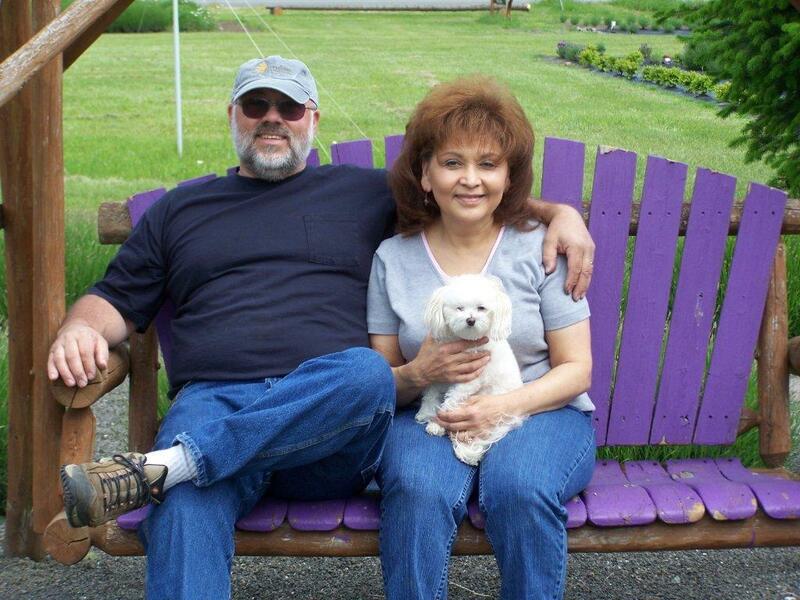 Carmen and Steve understand they are in the agritourism business, a blend of agriculture, tourism and entertainment. Their visitors expect an unforgettable experience. When you walk around this place, you feel like you’re in paradise. 7. Make sure your plants look their best. That means replacing plants that become stressed. 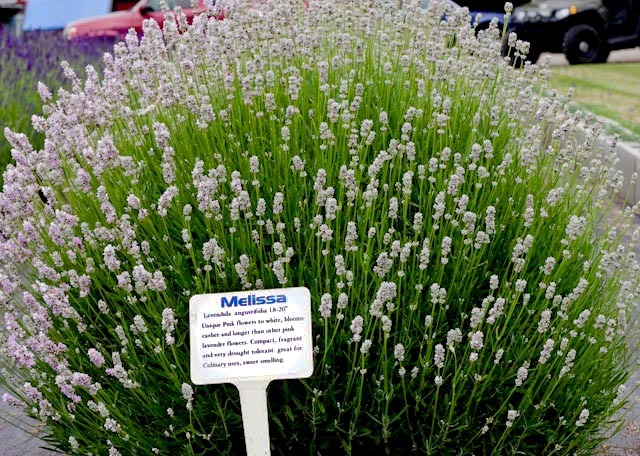 Lavender is the star of the show, every plant must look lush! 8. Place signs in the lavender fields describing the different varieties giving a brief summary of its characteristics. Sunshine Herb and Lavender Farm has more than 8000 lavender plants in its fields with some 65 varieties. Visitors can easily read about the various types and learn about their size and color. 9. Develop a unique and attractive array of gift items. Carmen began developing bath and beauty products when she operated her salon. Now, she creates soaps, face creams, hand lotion and more using the lavender oil that Steve distills from their harvest. What lavender oil they don’t use in their products, they bottle and sell in their gift shop. By tweaking family recipes and experimenting with lavender in the kitchen, Carmen wrote three cookbooks. 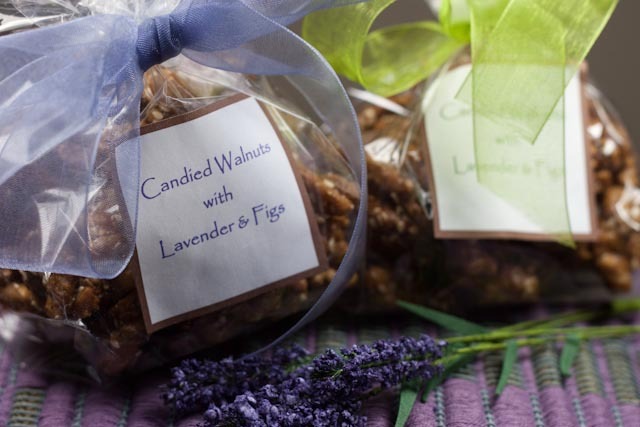 In the gift shop, she offers her own line of culinary products from culinary lavender buds to salad dressings and seasonings. 10. Have fun. Don’t get too busy to stop and smell the lavender. Steve and Carmen enjoy working together and caring for their farm and it shows in the relaxed atmosphere that makes Sunshine Lavender such a special place. Taking a leadership role in the lavender community, Steve has been elected president of the newly formed Sequim Lavender Farmers Association. The association is hosting an International Lavender Conference in 2012. The keynote speaker will be Tim Upson, author of “Lavandula, The Genus” considered the bible for lavender growers. Agritourism, still an emerging industry, comes in many forms. Wine-tasting, corn mazes, pumpkin patches and Christmas tree farms attract people who want to escape from their everyday routine and get a glimpse of another world. At Sunshine Herb and Lavender Farm, visitors discover the beauty of lavender and enjoy the gracious hospitality of Carmen and Steve Ragsdale. Le Melange Noveau - "A New Blend"
When I learned that Olympic Cellars had created a lavender-infused wine, I was skeptical. Yes, I adore lavender and I also appreciate wine. However when it comes to using lavender in food or drink, I’ve found that a little goes a long way. Use too much and what should be a delicately flavored dessert reminds me of an over-perfumed aunt or a bar of soap. What piqued my interest was the noble attempt to create a wine that celebrates the flavors of the Olympic Peninsula. 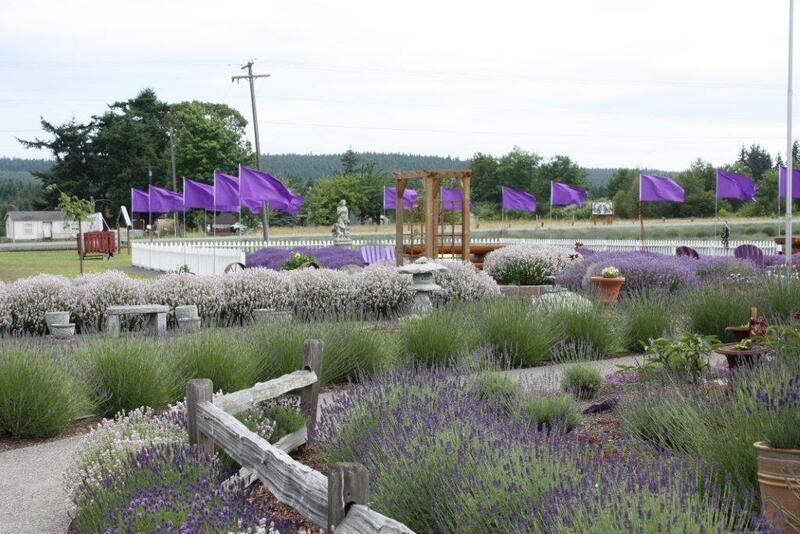 Sequim, after all, is well-known as “the lavender capital of North America.” And grapes grown in the relatively cool temperatures of the Olympic Peninsula’s coastal climate are especially aromatic bringing citrus notes to the palate. Olympic Cellars’ winemaker then, Benoit Murat, created the wine using locally grown grapes. And Charlton, along with her business partner and tasting room manager, Molly Rivard, experimented with infusing the wine with locally grown culinary lavender. The lavender buds were wrapped in cheese cloth and added to the wine. After 4-6 hours, the lavender was removed. “We went through this process until the bouquet included the lavender and there was the barest change in taste.” She emphasized, “We were not trying to overshadow the wine and were not aiming for the wine to taste like lavender.” Pleased with the result, Olympic Cellars named their new “baby” Le Mélange Noveau (French for “A New Blend”). The first limited vintage (2006) produced only 28 cases. Drinking wine with food ideally enhances the dining experience. Pairing food and wine can be complicated. So experts use the expression “What grows together, goes together” as a rule of thumb. Crab, salmon, clams and oysters, organically grown fruit and vegetables and artisan creameries all contribute to the rich and diverse flavors that have become known as Olympic Peninsula cuisine. With the introduction of Le Mélange Noveau, a local wine is now available to complement the region’s food. In Seattle on a hot September afternoon, my writing group sat around my dining room table. Although we don’t make a practice drinking wine at our weekly meetings, I invited members to participate in a wine-tasting session. I opened the ice-cold bottle of Le Mélange Noveau and poured a taste for everyone. 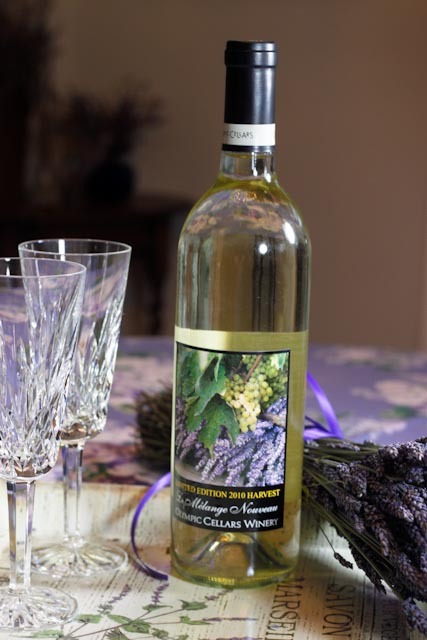 The label, a picture of white grapes with a lavender bouquet, made me think of late summer. Although I still consider myself a purist when it comes to wine, I would proudly serve this wine for a summer brunch. My taste buds come alive as I visualize a table with fresh berries, goat cheese, muffins and crab & asparagus Quiche served with the dry and delicate, Le Mélange Noveau. Kudos to Olympic Cellars! They got this wine exactly right. When it comes to lavender, less is always more! 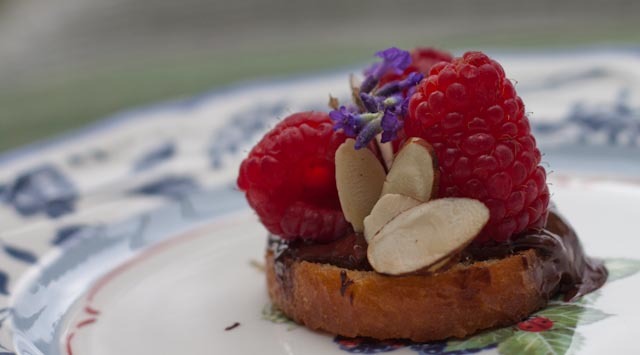 raspberry and Strawberry Bruschetta. Who doesn't love a quick and easy dessert? Step 1: Slice Baguette into 1/4 inch pieces. Butter each side of the bread. Place in skillet over medium heat. 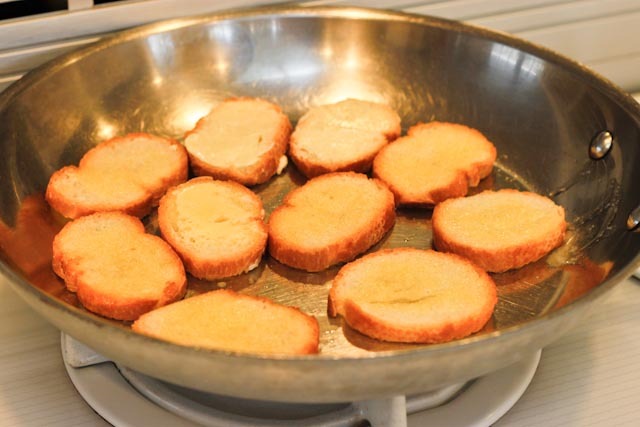 Toast until golden brown, then turn and toast the other side. This takes about ten minutes. Golden Brown on One Side, the Other Side is Still Toasting. 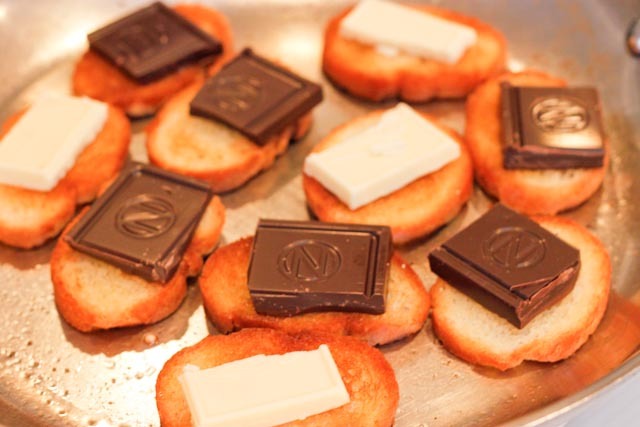 Step 2: Turn off the heat and place a square of chocolate (dark, white or whatever you like) on each baguette slice. Leave the bread in the skillet. Cover with a lid and let sit for 5 minutes to let the chocolate melt. When the chocolate becomes soft. Take a small knife and spread it over the bread. 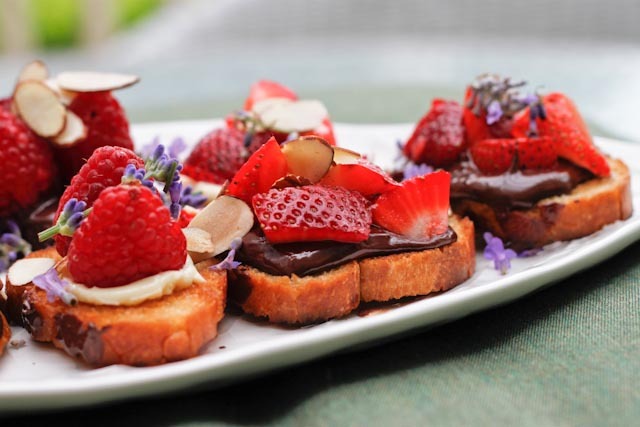 Step 3: Move bruschetta slices to platter, and cover with strawberries or raspberries. 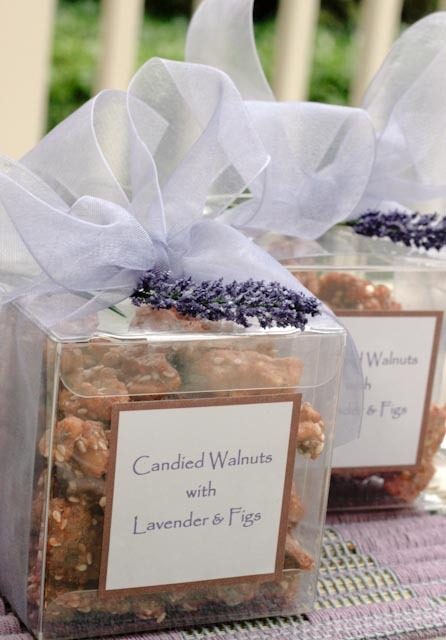 Sprinkle with sliced almonds and fresh lavender blossoms. Elegant, easy and exotic. Enjoy!